It’s not uncommon for a person to get bored with the way their home looks. 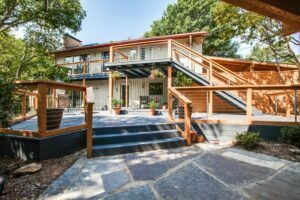 Unfortunately, most people don’t have the cash on hand for a full remodel or access to financing. However, there are a few ways you can do a home makeover without doing a full-scale job. Here are 10 mini-makeovers you can do to breathe new life into your home. You may think that since people don’t often look up at the ceiling, it doesn’t matter what it looks like. This is not true. If you add distinctive details to your ceiling, it can change the whole look of the room. Tin ceilings or stained wooden beams are a great way to change the room’s visual style. For a more contemporary look, you can add geometric patterns to your ceilings. Having a front or back porch to sit on is a welcome addition to any home. There are ways that you can revamp your porch, allowing you to use it more often. Adding screens to the porch is a great way to keep bugs away. Refinishing the floors will make it feel brighter. Finally, adding a light fixture and ceiling fan will make the old porch look like a brand new room. Click here to see more of the outdoor oasis in the picture. Having brand new cabinets installed can cost thousands of dollars, but there area few ways you can update them on a smaller budget. First, remove the doors on the upper cabinets. This will create a more airy feeling. Next, repaint the lower cabinets in a color that brightens up the room. Finally, replace the cabinet hardware with more contemporary hardware. It may sound too simple to be true, however, adding or updating the backsplash in your kitchen can change the look of the room completely. Modern materials, such as tile, granite, and tin are relatively inexpensive and can help create an entirely new look in the your kitchen. A great way to improve the look of your kitchen, as well as improve its functionality, is to install a kitchen island. 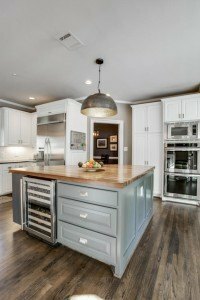 Having an island installed by a professional will ensure that it blends well with the rest of your kitchen. Consider painting it a different color or using a different countertop material to make your island an instant showpiece, like the one pictured to the left. Do you like what you see? Check out more of this whole home transformation here. If you cannot afford to replace your old boring bureaus, you can make changes to give them a newer look. You can either repaint or stain the dresser, possibly adding decorative stencils to the drawers for a child’s room. You can also switch your old hardware with newer, more modern hardware. To highlight the items and decorative objects on your bookshelf, purchase a few accent lamps. The lamps can be pointed to shine on your valuables, turning the shelf into the focal point of the room. Adding a fresh coat of paint to the inside or outside of your front door is an easy and inexpensive home makeover. It will also brighten up the whole entryway inside, and give the outside of your home added curb appeal. To make a fun change in the kids’ room, repaint the bottom of the wall with chalkboard paint. The room will have a new look, and it will give the kids a creative and interactive space to enjoy. To make a big clock look more interesting, remove the hands and spray paint them a fun color. This will give it a fun modern update, and add an unexpected pop of interest to your space. Sometimes all you need for a home makeover is a small change. Which one of these ideas will you pick? From new floors or fresh paint to full-scale remodels and additions, DFW Improved has everything you need for a home makeover. Click here to request an estimate.